Technology and marketing have transformed the traditional bellwether “Black Friday,” into an extended five-day holiday shopping weekend that opens on Thanksgiving Day, and has added Small Business Saturday and Cyber Monday. Approximately 247 million people shopped in stores or online during Black Friday weekend, nearly 21 million more than last year. Deep discounts remain a big attraction for shoppers, particularly on the heels on the recession. Online sales and mobile technologies have proven to be game changers for retail sales, hugely augmenting traditional store sales. Black Friday weekend kicks off the holiday shopping season, a time of critical importance to the retail industry, as holiday sales account for 20 percent of total retail sales on average. Black Friday weekend sales reportedly totaled $59.1 billion, a 12.8 percent increase over last year. On average, each shopper spent $423, or 6.1 percent, more than last year. Shoppers spent 41 percent of this total, or nearly $173, online at multiple websites. Apparel, toys, books and electronics drew the majority of buyers and nearly one-third of shoppers also bought gift cards. 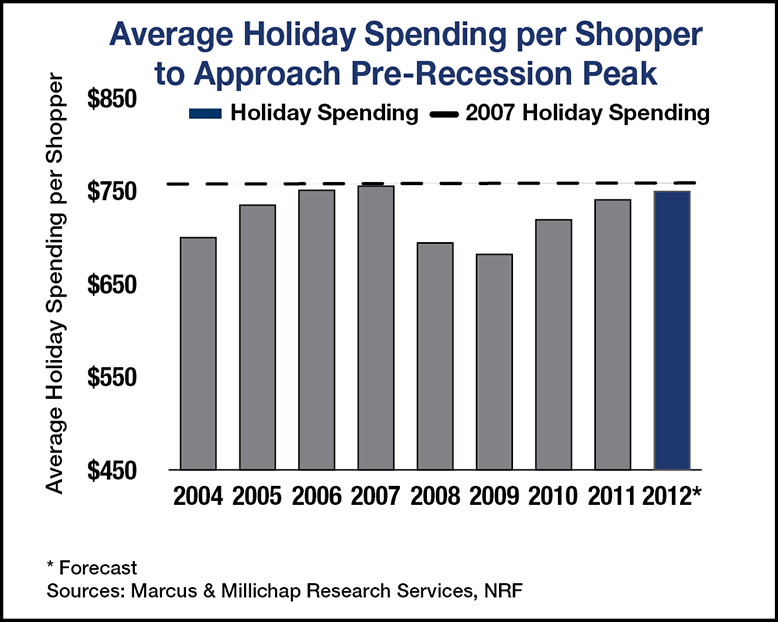 Total holiday sales are forecast to reach $586 billion, surpassing 2011 holiday sales by 4.1 percent. In addition, each shopper expects to spend an average of $741 this year, nearly 5.5 percent higher than last year. In all likelihood, pent-up demand will drive retail sales even higher, with the possibility of besting the record $755 per person set in 2007. Online sales Thanksgiving Day, Black Friday and Cyber Monday grew 39.3, 24.3, and 30 percent, respectively. Many department stores felt the payoff from heavy investment into their online platforms to compete with Amazon and eBay, reporting a 59 percent increase in online sales over last year. The success exhibited by the robust start to the holiday sales season aligns with fairly strong consumer expectations, but is incongruous with other economic indicators that reflect a slowing economy. The “fiscal cliff” diminished business spending in October, while Hurricane Sandy affected production and created a pull-back in sales. However, November auto sales surged 15 percent compared with a year ago, the strongest pace in more than four years, representing an annualized sales rate of 15.5 million units. The strength of online retail sales underscores the critical and expanded role of ecommerce in the retail industry. Additionally, the use of mobile technologies generated a significant shift in consumer shopping patterns, with an estimated 10 percent of online orders placed from mobile devices, up from 3.2 percent one year ago. The emphasis on more compact store formats and online platforms suggest reduced retail space requirements and an uptick in showroom formats. However, new venues that include entertainment concepts and unique eateries, together with stores will continue to draw shoppers. Retail space fundamentals continue to progress, albeit slowly. Demand will continue to outpace minimal new supply, resulting in a 50-basis point decline in vacancy to 9.2 percent and modest effective rent growth. Industrial properties could benefit broadly from ecommerce trends. With brick-and-mortar stores stocking less product and with growing competition from online retailers, department stores will need increased required storage. At the same time, online rivals are focusing on product delivery at the lowest cost and in the shortest time, requiring additional local warehousing. Outsized demand for industrial space should quickly assimilate new supply, tightening vacancy to 11.0 percent by year end. Supply constrained coastal and distribution hub markets will see superior operational results. This entry was written by marcusmillichap, posted on December 6, 2012 at 5:55 pm, filed under Research and tagged Commercial Real Estate, retail. Bookmark the permalink. Follow any comments here with the RSS feed for this post. Trackbacks are closed, but you can post a comment. very good article reflecs the real world.